US $887,595 in 2013. US $1,293,878 in 2012. US $1,564,266 in 2011. US$852,445 (2009) 38% on 2008. 17% on 2009. The James Randi Educational Foundation (JREF) was started as an American non-profit organization founded in 1996 by magician and skeptic James Randi. The JREF's mission includes educating the public and the media on the dangers of accepting unproven claims, and to support research into paranormal claims in controlled scientific experimental conditions. In September 2015, the organization said it would change to a grant-making foundation. The organization administered the One Million Dollar Paranormal Challenge, which offered a prize of one million U.S. dollars to anyone who could demonstrate a supernatural or paranormal ability under agreed-upon scientific testing criteria. The One Million Dollar Paranormal Challenge was terminated in 2015. The JREF also maintains a legal defense fund to assist persons who are attacked as a result of their investigations and criticism of people who make paranormal claims. The organization has been funded through member contributions, grants, and conferences, though it will no longer accept donations or memberships after 2015. The JREF website publishes a (nominally daily) blog at randi.org, Swift, which includes the latest JREF news and information, as well as exposés of paranormal claimants. The JREF officially came into existence on February 29, 1996, when it was registered as a nonprofit corporation in the State of Delaware in the United States. On April 3, 1996, Randi formally announced the creation of the JREF through his email hotline. It is now headquartered in Falls Church, Virginia. THE FOUNDATION IS IN BUSINESS! It is my great pleasure to announce the creation of the James Randi Educational Foundation. This is a non-profit, tax-exempt, educational foundation under Section 501(c)3 of the Internal Revenue Code, incorporated in the State of Delaware. The Foundation is generously funded by a sponsor in Washington D.C. who wishes, at this point in time, to remain anonymous. Randi says Johnny Carson was a major sponsor, giving several six-figure donations. Director, Chairman: James Randi, Ft. Lauderdale, Florida. Director, Secretary, Assistant Secretary: Richard L. Adams Jr., Ft. Lauderdale, Florida. Director, Secretary: Daniel Denman, Silver Spring, Maryland. In 2008 the astronomer Philip Plait became the new president of the JREF and Randi its board chairman. In December 2009 Plait left the JREF due to involvement in a television project, and D.J. Grothe assumed the position of president on January 1, 2010, holding the position until his departure from the JREF was announced on September 1, 2014. The San Francisco newspaper SF Weekly reported on August 24, 2009, that Randi's annual salary is about $200,000. In 1964, Randi began offering a prize of US$1000 to anyone who could demonstrate a paranormal ability under agreed-upon testing conditions. This prize has since been increased to US$1 million in bonds and is now administered by the JREF. Since its inception, more than 1000 people have applied to be tested. To date, no one has been able to demonstrate their claimed abilities under the testing conditions, all applicants either failing to demonstrate the claimed ability during the test or deviating from the foundation conditions for taking the test such that any apparent success was held invalid; the prize money remains unclaimed. However, in 2015 the James Randi paranormal challenge was officially terminated. Since 2003, the JREF has annually hosted The Amaz!ng Meeting, a gathering of scientists, skeptics, and atheists. Perennial speakers include Richard Dawkins, Penn & Teller, Phil Plait, Michael Shermer and Adam Savage. The foundation produced two audio podcasts, For Good Reason which was an interview program hosted by D.J. Grothe, promoting critical thinking and skepticism about the central beliefs of society. It has not been active since December, 2011. Consequence was a biweekly podcast hosted by former outreach coordinator Brian Thompson in which regular people shared their personal narratives about the negative impact a belief in pseudoscience, superstition, and the paranormal had had on their lives. It has not been active since May, 2013. and Consequence. The JREF also produced a regular video cast and YouTube show, The Randi Show, in which former JREF outreach coordinator Brian Thompson interviewed Randi on a variety of skeptical topics, often with lighthearted or comedic commentary. It has not been active since August, 2012. In November 2015, Harriet Hall produced a series of ten lectures called Science Based Medicine for the JREF. The videos deal with various complementary alternative medicine subjects including homeopathy, chiropractic, acupuncture and more. The JREF posts many of its educational videos from The Amaz!ng Meeting and other events online. There are free lectures by Neil DeGrasse Tyson, Carol Tavris, Lawrence Krauss, live tests of the One Million Dollar Paranormal Challenge, workshops on cold reading by Ray Hyman, and panels featuring leading thinking on various topics related to JREF's educational mission. JREF president D.J. Grothe has claimed that the JREF's YouTube channel was once the "10th most subscribed nonprofit channel of all time, though its current status is 39th and most non-profits do not register for this status. The foundation produced its own "Internet Audio Show" which ran from January–December 2002 and was broadcast via a live stream. The archive can be found as mp3 files on their website and as a podcast on iTunes. As part of the JREF's goal of educating the general population about science and reason, people involved in their community actively run one of the most popular skeptic based online forums at http://forums.randi.org with the overall goal of promoting "critical thinking and providing the public with the tools needed to reliably examine paranormal, supernatural, and pseudoscientific claims". On October 5, 2014, this online forum was divorced from the JREF and moved as its own entity to International Skeptics Forum. The JREF has named a number of fellows of the organization including Senior Fellow Steven Novella and Research Fellows Karen Stollznow, Tim Farley and Ray Hall. Kyle Hill was added as a fellow November 2011, and Leo Igwe was added October 2012. Farley's position as a JREF Fellow ended in February 2014. Two zombies hold a check for one million dollars for James Van Praagh if he can prove he can talk to the dead. In 2007 the JREF announced it would resume awarding critical thinking scholarships to college students after a brief hiatus due to the lack of funding. The JREF has also helped to support local grassroot efforts and outreach endeavors, such as SkeptiCamp, Camp Inquiry and various community-organized conferences. However, according to their tax filing, they spend less than $2,000 a year on other organizations or individuals. Rationalist Prabir Ghosh increases his challenge amount to $50,000 against any claim of paranormal, after surviving nine assassination attempts. ↑ "990 Form from 2008 for The James Randi Educational Foundation(cite line 12)" (PDF). Foundation Center. ↑ "2009 Form 990" (PDF). GuideStar. Retrieved 11 September 2011. ↑ "Form 990 for 2010" (PDF). GuideStar. Retrieved 12 September 2011. ↑ "JREF Status". James Randi Educational Foundation. JREF. Retrieved 3 September 2015. ↑ "Prove Your Supernatural Power and Get Rich". Skeptoid.com. 2013-07-23. Retrieved 2014-01-04. ↑ "Department of State: Division of Corporations - Entity Details - The James Randi Educational Foundation". Retrieved 2012-03-03. Delaware Dept. of State, Division of Corporations official website, Corporation Name Search: "The James Randi Educational Foundation. Incorporation Date / Formation Date: February 29, 1996. Entity Type: NON-PROFIT OR RELIGIOUS." 1 2 "Los Angeles Office Closed". James Randi Educational Foundation. September 1, 2014. Retrieved 2014-09-02. ↑ "filing with Florida State Department". Florida Department of State Division of Corporations. Retrieved 26 August 2012. ↑ "Phil Plait New JREF President". Retrieved August 8, 2008. ↑ James Randi. "Exciting Times at The JREF". JREF News. Retrieved December 21, 2009. ↑ "The Demystifying Adventures of the Amazing Randi". Retrieved September 5, 2009. SF Weekly, August 24, 2009, online version, page 2: "One of his friends, Internet pioneer Rick Adams, put up $1 million in 1996." ↑ Board of Directors of The James Randi Educational Foundation. "JREF Status". James Randi Educational Foundation. James Randi Educational Foundation. Retrieved 15 October 2016. ↑ "For Good Reason podcast". ↑ "For Good Reason podcast". Forgoodreason.org. Retrieved 2013-07-02. ↑ "Consequence Podcast". "Consequence Podcast". Retrieved 2013-07-02. ↑ "The Randi Show". Youtube.com. Retrieved 2013-07-02. ↑ Hall, Harriet. "Science Based Medicine". JREF. Retrieved 14 June 2016. ↑ "JREF Video Channel on YouTube". Youtube.com. Retrieved 2013-07-02. ↑ D.J. Grothe. "Enjoy the JREF on YouTube". ↑ "YouTube Top 100 Most Subscribed Non-Profit & Activism Channels List - Top by Subscribers". ↑ "Internet Audio Show". The James Randi Educational Foundation. 3 January 2002. ↑ The James Randi Educational Foundation (3 January 2002). "Internet Audio Show". iTunes. ↑ "Forum Homepage". forums.randi.org/. Retrieved 2014-04-04. ↑ "Educational Programs". randi.org. Retrieved 2014-04-04. 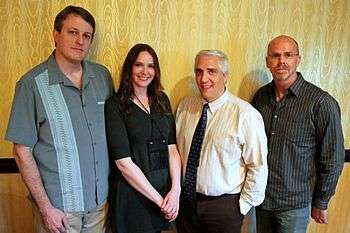 ↑ "Dr. Ray Hall Appointed as New JREF Research Fellow". JREF SWIFT blog. James Randi Educational Foundation. July 1, 2011. Retrieved July 10, 2011. ↑ "Kyle Hill Appointed as JREF Research Fellow". JREF SWIFT blog. James Randi Educational Foundation. November 11, 2011. Retrieved December 12, 2011. ↑ "Leo Igwe partners with JREF to respond to witchcraft problem in Africa". Doubtful News. Retrieved 2013-02-17. ↑ Farley, Tim (14 June 2014). "Online resources for The Amazing Meeting #TAM2014". Skeptical Software Tools. Retrieved 17 December 2014. ↑ "The James Randi Educational Foundation Scholarships". Randi.org. 2009-04-20. Retrieved 2009-06-15. ↑ "Camp Inquiry — Holland, New York". ↑ "JREF Offers a Number of Scholarships and Grants for Students, Educators and Local Skeptic Groups". Randi.org. Retrieved 2013-07-02. ↑ "JREF tax filing 2012" (PDF). Guidestar.org. Retrieved 2013-11-07. Christopher, Milbourne (1975). "Mediums, Mystics, & the Occult". Thomas Y. Crowell Co. ISBN 0-690-00476-1. Polidoro, Massimo (2003). "Secrets of the Psychics: Investigating Paranormal Claims". Prometheus Books. ISBN 1-59102-086-7. Randi, James (1982). "Flim-Flam!". Prometheus Books. ISBN 0-87975-198-3. Wikimedia Commons has media related to James Randi Educational Foundation.